Woof! Woof! Miss Olive wishes everyone a very Happy Friday and “St. PETrick’s Day”! 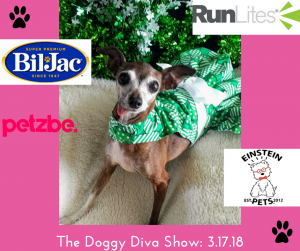 ☘ We have pawtastic guests this week and a Doggy Diva listener special of 25% off Go RunLites -the latest in pet safety!  Kim Gaebelein: Senior Director of Marketing at Bil-Jac Foods has helpful advice for pet parents during “Pet Poison Awareness Prevention Month”www.bil-jac.com.  Andrea Nerep: Founder/CEO of Petzbe a fun new app voiced entirely by pets‎. www.petzbe.com.  Mary Tiffin : Founder of Go RunLites a new safety ‎and dog walking essential for pet parents. Visit www.gorunlites.com and enter DOG DIVA for 25% off your purchase.  Kelly Ison: CEO of Einstein Pets shares the latest in their healthy and yummy treats. Please visit Kelly at booth #3557 ‎at the Global Pet Expo in Orlando 3/21 – 3/23. www.einsteinpets.com.